Yay I’m back to blogging a little more regularly! The results are official now. 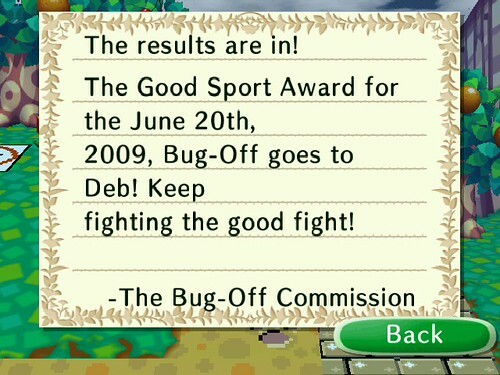 Squirt won the Bug-Off! The golden bug trophy has been proudly displayed in the Tomb Room. Deb logged in yesterday just to check the ‘score’, and jokingly submitted a tiny bug just to see what the score would be. Little did she know a surprise would be waiting for her the next day! While today wasn’t an exciting event like yesterday, it was still a holiday. Happy Father’s Day! Squirt’s Dad sent him a “Pop’s Quiz!” in the mail, with red carnations attached. I added them to the garden. Also, a little bird told me that it was Midsummer’s Day in Europe. (Why do they get such cuter holiday names??) And not only that, but there was new European DLC released today! So there was much to do. Deb checked the gate first thing in the morning, but only Doomdoom (full of gloomy doomy rain lol) was open. I popped in to say hello. We marveled at each other’s keen fashion sense. We’ve both been approved as official Fashionistas. ANYWAY, back to the hunt for rare European items. Squirt logged in and waited at the gate for any sign of my European friends. Not a Union Jack in sight, but I did see that Glitch was open, where my friend No Name lives. 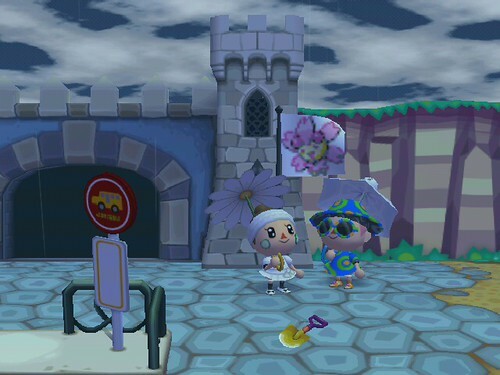 He lives in the same area as me, so I wasn’t going to find any new items, but I was able to let him catalog the ghost umbrella. So the hunt for rare European items was a success! But that doesn’t mean the hunting was finished for Shaolin! I’ve made it my priority the past few evenings to try and find the Piranha, the Hammerhead Shark, and the Tarantula. It hasn’t been much of a success. Quite a few small sized fish have escaped me while I was fishing, so I am pretty convinced that they were piranhas lol. I stayed in the north area river for a long time, so around 8PM I finally decided to head to the beach to look for some sharks. A warning? Or a tough-love pep talk? I don’t really understand this unprovoked aggression. They both walked away like nothing happened after Ruby’s outburst. It was a little weird. Was she warning me? Was she trying to give me some not-so-friendly advice? 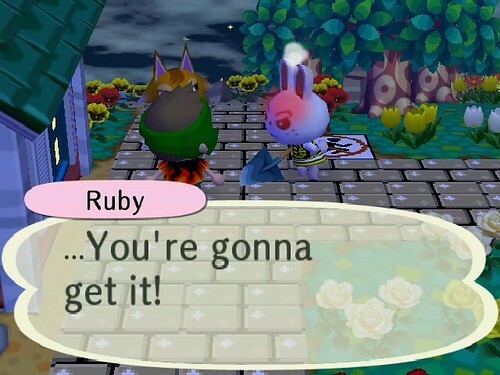 Or was I merely a test dummy for Ruby’s weird threat? Things were about to get a lot weirder… I continued on towards the beach. I really want a Hammerhead Shark! I had my fishing rod at the ready as I walked over the South Bridge. 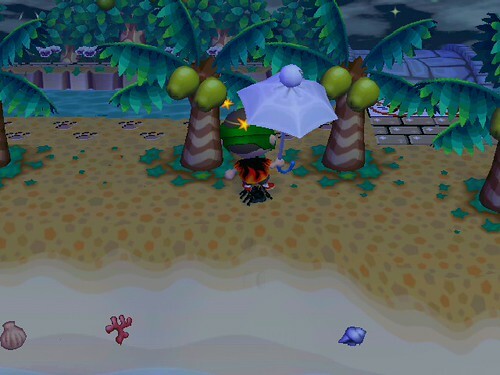 When I stepped onto the sand, I noticed something next to me. Something BIG. Apparently it didn’t see me and the Tarantula walked out of frame. In a panic (I didn’t know WHAT to do!!) I switched to my net. I could hear the Tarantula’s excitement as he scuttled back for the kill. Frantically, I switched to another tool in hopes that it would stop. But it was too late! Looks like the hunter became the hunted! I’m excited about the long awaited photo shoot tomorrow. Hopefully you’ll have a lot more to blog about. Catch that tarantula so I can come over and look at it in the museum since I haven’t even seen one! Eek! That just happened to me, too! I tried to get behind it with my net but he was too fast for me! Wonder if we’ll get immunity to the stings…?